I can't figure out where to post on your blog. Finally found a spot a few days back hope you see it because I'm loving these pictures, especially those duckies on momma's back! Cool mosaic, love that neat looking snowman! HRG: Why what a fun post but what type of critter is that on the right? Loved the Youtube of the dog. It is so full of life and fun. Mercy, they sure are all dressed up for the holidays and they look great. I love what you did to that tree. Please come and meet our New Baby Champ. Merry Christmas! Now this is creative and neat! I LOVE that tree/shrub made to look like a bird...what an amazingly creative idea! I'm always fascinated by your beautiful compositions, cute! 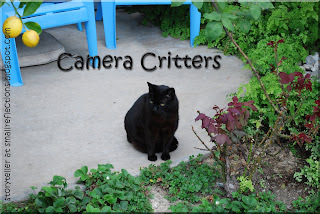 I really like the critters you found in your neighborhood. The critter on the ledge is really something, but at least he has his Santa hat on. Nice photos! Thanks for stopping by today. thank you for your snow dog! adorable! and looks like we have Taos connection too, I am in Two Graces Gallery in Ranchos... love your beautiful shots of Taos and MDL house! Love your Christmas critters - very festive! I really enjoyed the dog in the snow - my word! - but I did worry that he might suffocate one day! I love the video, that is one happy puppy. Great mosaic with a unusual group of critters. There is a lot of imagination in your neighborhood. What a fun mosaic! And love the Dr. Seuss "Thought for the day"!! I enjoyed the youtube film...what a gleeful dog! 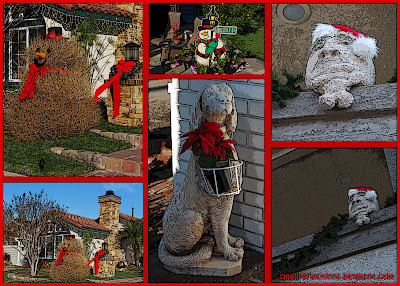 I love these creative outdoor Christmas critter and your mosaics...good job! Happy Mosaic Monday! Merry Christmas ! Well, without snow you can't make a snowman. But your SoCal improvisation of a snowbale (what to call it?) works just fine here. And it won't melt! your snowman er...baleman is quite unique:) just love your reds and they look so Christmasy festive:) Happy RT and Merry Christmas! Cute! I am enjoying weeing how people celebrate Christmas. 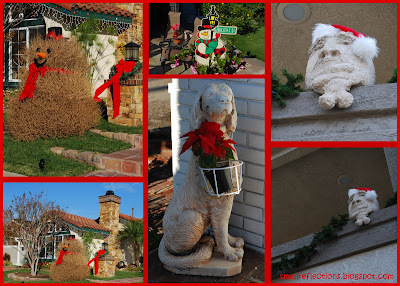 I have never seen a tumbleweed snowman or Humpty Dumpty as decorations for Christmas before! beautiful red accents! have a wonderful Christmas! great mosaic ; lovely rubies! Wishing you a magical memory making Merry Christmas! !